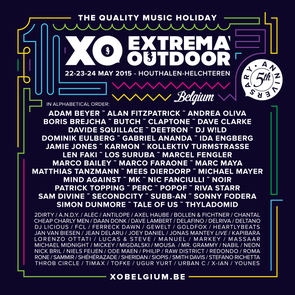 Extrema Outdoor Belgium celebrates its fifth anniversary on 22, 23 and 24 May with a massive DJ line-up pushing the best in electronic music. Genres from deep house, tech house and techno join hands to make sure all visitors enjoy the likes of Jamie Jones, Tale Of Us, Adam Beyer, Dave Clarke, Nic Fanciulli, MK, Boris Brejcha, Matthias Tanzmann, Claptone and Ida Engberg plus many more. The 13 stages should guarantee every itch will be scratched on this extended Pentecost weekend. Some of these stages are exclusive with Circoloco, Elrow and ANTS flying over from Ibiza, Drumcode and Defected representing some of the finest record labels and nightclubs La Rocca, Labyrinth Club and Caféd'Anvers bringing the best of their scene to the festival.